Club Lobby 777 is located at No 5 Viline Vode Street. This club is located not far from downtown, on location which is big and spacey and this club can accommodate around 1000 people. Club Lobby 777 represents juncture of modern and traditional in new, interesting and attractive way. This fantastic club will offer you the best service in Belgrade in accordance with world's trends along with element from cosine and entertainment industry. Club Lobby 777 contains local cousin restaurant with large garden and club for nightlife entertainment. And you should definitely experience night party in club Lobby 777. This club also offers you day-evening variant in restaurant, called - Lobby paradise. With light music, you can relax and enjoy in gastronomic specialties and delicious cocktails prepared by professional bartenders. This club consists of two levels. Ambient of club is very pleasant and full of positive energy. Club has cozy booths and in central part bar tables. Architectural structure of the club is very convenient, and wherever you are always in center of attention. In this club it's not unusual to hear live performances of most popular regional singers, so fun is guaranteed. Walls are made of bricks and stone which gives you expression of elegant, but urban look. Precisely, these materials provide excellent sound, in which you will be assured when you come to club Lobby 777. National Menu is one thing on which staff of club Lobby 777 is very proud of. It's not common in other restaurants and provides you complete enjoyment and organizing business lunches. The most quality music program and excellent surround system will move standards of urban fun, only in club Lobby 777. 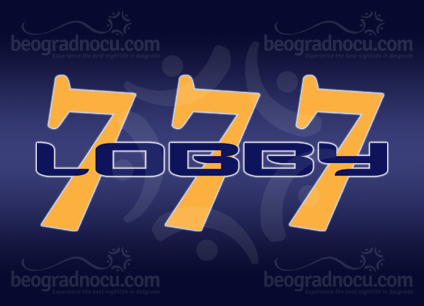 Ensure yourself, that club Lobby 777 is tucked peace of paradise in Belgrade and ideal for getaway. Here you will always be welcomed with smile and embrace. Who enters this club once, always comes back.